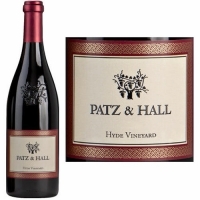 Medium ruby-purple colored, the 2016 Pinot Noir Hyde Vineyard is profoundly scented of black cherries, black raspberries and redcurrants with touches of forest floor, black soil, stewed tea and lavender. Medium to full-bodied, it offers mouth-filling red and black berry flavors with a firm line of fine-grained tannins and wonderful freshness, finishing spicy. Drink 2018-2028. A standout wine of the vintage, 2016 delivered a spectacular expression of Hyde Vineyard Pinot Noir. The nose is vivid and complex with floral aromas of rose and carnation, alongside layers of cherry, clove, white chocolate, five-spice powder and fine herbs. The palate is broad and flavorful, with firm tannins and hints of moist earth underscoring vibrant notes of strawberry jam, brandied cherry and espresso. With even more fruit and acid than the exceptional 2012 vintage, this alluring and dynamic Pinot is something special.